We've used ray-tracing to render the PC Gamer editors' hot takes this week. Looks too real, honestly. 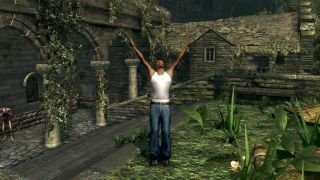 Praise Grove Street and Hyrule—both CJ from San Andreas and Link for the Legend of Zelda series were modded into Dark Souls: Remastered this week. And while this alone is pretty great news (Link’s character animations and audio were also introduced, as was this glorious image of CJ), it’s also, potentially, the start of something bigger. As outlined by prominent Souls figure Zullie The Witch, a new import tool now allows mod makers to add models from other games. “Dark Souls mods have the potential to get a whole lot stranger,” says Zullie. I say bring it on. As of writing this high, I’ve played only one match of Blackout, Call of Duty: Black Ops 4’s new battle royale mode. I skipped out on getting into PUBG, but I’ve been playing Fortnite like it’s my job (it sort of is) for the past year, and I’m surprised how many skills transition between most battle royale games. I got fourth in my first Blackout match, along with a few kills, though I’ll credit most of my success to somewhat smart positioning. Predicting where most players will land based on the initial flight route and first few circles is key to making sure you’re not going to end up getting shot at from every side. Rotating around the incoming circle towards the far side of map where fewer players (probably) landed ensures you’ll find action, but less density of it. Landing at Blackout’s Tilted Towers, whatever that ends up being, is also a valid strategy, I’m just not that great at no-scoping. I find tactical positioning more satisfying anyway. It’s not likely Blackout will be my thing, but I’m happy that I can slip into most battle royale games and find my feet without too much trouble. Frostpunk was probably my favorite game this year, and the updates and add-ons have been sprinkling in like snow since its release. A story-driven scenario called The Fall of Winterhome is arriving next week, and I'm ready for it. If you played the base game, Winterhome is a city you send your scouts to investigate, and in this expansion it sounds like we'll finally get to learn what really happened there. Will we be managing Winterhome? Will we be able to save the city? I'm eager to find out. The Nvidia Turing architecture deep dive is here, all 4,000 words of it. Does that seem too long? It’s actually the condensed version of 144 slides of information plus 83 pages of technical whitepaper descriptions, about 18,000 words or so. And another 2,600 on ray tracing for good measure. We feel pretty good about hitting all the major points, though maybe we should work on refining the algorithms to get down to 2,000 words next time? Oh crap, we let the cat out of the bag. JARRED is actually an acronym for a machine learning journalist AI trained on Nvidia’s SaturnV supercomputer, designed to spit out technical babble on graphics cards, processors, and more. When we upgrade the hardware with Turing GPUs, just wait and see how awesome ‘his’ articles become! We're not sure what JARRED stands for, to be honest, but let us know if you have any ideas. This week, I'm going to use my powers for good, and point you in the direction of a charming adventure platformer that's due out later this month. I first played Wandersong as part of last year's IGF and thought it was a wonderfully entertaining thing. It's a game about singing—using a wheel of notes to colour-match songs and complete puzzles. More than that, though, it's a game about the joy of song. Your singing has an effect on the world, but it's also entertaining to just create little tunes as you're walking through the world. I only played the first couple of chapters—I can't speak to how good it is across the entirety of the game—but I enjoyed those early hours a lot. This is one to keep on your radar. I’ve spent most of this week thinking about eldritch horrors and chatting up sailors. A pretty normal week then. Call of Cthulhu is out next month, but a video showing off the first hour appeared on the weekend (I posted it on Monday so it definitely counts as this week) and my mind keeps drifting back to it. It’s an RPG, but there’s no fighting or HP or other conventional trappings. The tabletop RPG of the same name serves as the main inspiration, and it’s also one of my favourite RPGs of all time. It’s the sort of game where books can fracture your mind, or witnessing something disturbing could lead to you developing echolalia. Both things have happened to me. And the videogame appears to be following suit, much to my delight. Lovecraft knock-offs might be a bit trite these days, but this is one I’m very much looking forward to.